December! That most special time of the year when Charleston truly dresses to the nines to greet her guests and visitors and to welcome home those friends and relatives who’ve moved to other locales: lampposts are festooned with evergreen boughs and bright red ribbons… storefronts entice shoppers with holiday displays and offerings… even the boats in town are decorated with impressive and imaginative electric light displays(32nd Annual Holiday Parade of Boats will be held in the Charleston Harbor on Saturday, December 7)! Though we love the Carolina Lowcountry during the eleven other months of the year, being in Charleston in December feels like a privilege as there are so many exciting and diverse experiences and events from which to choose, ranging from seeing “Scuba Claus” at the South Carolina Aquarium’s Great Ocean Tank, taking in the Holiday Festival of Lights at James Island County Park, enjoying Charles Dickens’ “A Christmas Carol” at the Woolfe Street Playhouse… to listening to the Charleston Symphony Orchestra’s presentation of George Frideric Handel’s “Messiah” led by visiting conductor Darko Butorac, keeping pace in the 23rd Annual Reindeer Run, to the ever-popular Sundays on King Street, when Charleston’s most celebrated shopping district is closed to vehicular traffic and pedestrians and pets rule. We love December in Charleston! 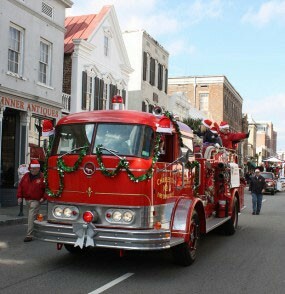 For a very comprehensive roster of events, please visit Christmas in Charleston, then… come visit Absolutely Charleston!